I experienced the wind noise, from the driver's side, but I applied some Krytox 205 to the door seal and it hasn't returned. The dash rattle comes and goes, I cannot figure that one out; just poor materials and agree, my BMWs had far fewer rattles and creaks. I have a dash rattle too. Try this: When it comes back, pinch together the top and bottom of the dash just behind the top of the steering wheel. (The part of the dash that shields the IC from the sun.) 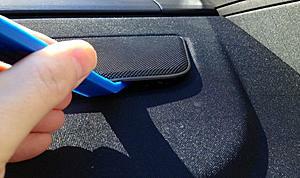 In my car, the rattle will not stop if I press just the top or just the bottom - I have to pinch them together. I will let the dealer fix next time I take the car in. Meantime I might ghetto it by putting a binder clip on it (just kidding!). THANKS! I haven't thought of that as it looked like one piece. Funny thing in this car, sounds bounce around, making it difficult to pinpoint! I know the steering paddles rattle and so does the dimmer rheostat. On the door, all the seat control buttons can rattle, but usually only in the cold. i have a brand new bluetec with a rattle in the back of the car, sounds like the rear decklid. Anyone successfully have this fixed? I found my rear rattle to be the panel topmost rear of the headliner. Got a little rattle in the driver side gauges. When I press on the plastic on the screen, it goes away. Need to find a way to fix this asap. The first cold day and a new very bad rattle starts at the rear of the car. It is coming from the rear deck where the speakers are mounted. Tapping on this flimsy deck produces very bad rattling noise. Anybody have instructions of how to remove the deck? Would like to have a look myself as this could be very easy to fix. The rear plastic piece is easily removed, just be careful not to break any of the tabs. You may have a wire or connector loose beneath, which may be seen from the trunk but you may have to lie upside down to view anything. How do you easily remove the plastic part? I'll pry mine up tomorrow morning and snap a pic, I carefully lifted from the headrest side, small snap clips hold it in. I have a photo, it's on my phone, I've just been travelling for the holidays. I'll see if I can post it today sometime. I'll be taking mine up as soon as I see the photo. Here you go, Arrie. As you can see from just under the panel, there are plastic stubs. They click FIRMLY into place, so if yours is loose, you could be hearing the rattle. These tabs are dispersed all around the panel. I found mine was loose in the rear. I am using a plastic door panel remover but you can also use an old credit card as well. nothing is visibly loose under the plastic piece. I need to have the deck cover that the plastic piece attaches to removed so I can get access there. Anybody have instructions how to remove the deck cover? I'm quite surprised to see that the W212 is still having the continued rattle problems that I had in my W212--dash, command, headliner, rear shelf, etc. I'm disappointed that MB has not addressed these quality problems. Last edited by Grau E350; 11-24-2012 at 09:45 PM. Reason: i rattled on too much. 25K miles and no rattles at all. I had a really annoying rattle in my former C300 and for a time I thought it was in the dashboard, but finally tracked it down to the mirror. I hate to doubt your ears, but you'll be the first to have NO rattles at all in a W212. I think some people are more prone to hearing them, along with a tolerance, but the W212 is loaded with cheap plastic in the dash, wood panels, and the pillars. Wait for a cold morning, don't use the radio or accessories and just listen to the symphony of rattles. I've given up on the small ones, but did address the major rattles. Had mine for a few months, no rattle occasional pana roof noise and that's it. But then, I use the remote start and warm up the car when it's cold in the morning. Guess I'm lucky, but no rattles in my car. However, the sunroof does creak when opening/closing after car has set in hot sun for a while. My e550 is coming in on 2 years old and around 26,000 miles. I drive on the crappy NY/NJ roads and no rattles yet. I'm very impressed with the fit and finish. Still tight as a drum. Regards. Ned. My 2010 e350 has a noise like a little motor running in the front roof console. It will continue after the car is off for awhile. I first thought it was in the area of the glove box. It is definitely coming from the ceiling. Anyone have a thought? For those without any rattles whatsoever (still not a believer), how many have the luxury suspension? 45K miles on my 2011 Bluetec and only the slightest"rattle" sounds when going over very rough pavement....99% rattle-free. In my neck of the woods, the Department of Transportation is just as likely to pave over a boulder than remove it. We have some really crappy roads. I find my E to have superior build quality and chassis strength.